One thing we’ve talked about very little here at 13th Dimension over the years has been Super Friends. Live now is the first episode of The World’s Greatest Super Friends Podcast, co-hosted by John S. Drew and yours truly. Starting with this debut ep on The Chronic Rift network, John — perhaps best known for The Batcave Podcast — and I will be going episode by episode through the run of the classic ABC cartoon. We’ll also be talking about the show’s influences and the impact it had on us ’70s (and ’80s) kids who spent Saturday mornings hopped up on Honeycomb, Froot Loops or Count Chocula. The show premiered Sept. 8, 1973, with The Power Pirate and you can listen here or download the podcast on iTunes, Stitcher or however you find your audio entertainment. Huzzah! About time we got a dedicated Super Friends podcast from some folks whose work I already enjoy! Can’t wait to listen! Good luck! And if you need some guests, I know a few guys over at the Fire and Water Network who’d be happy to join you! Thanks, Chris! And don’t be surprised if we darken your doorstep! I loved the first podcast! 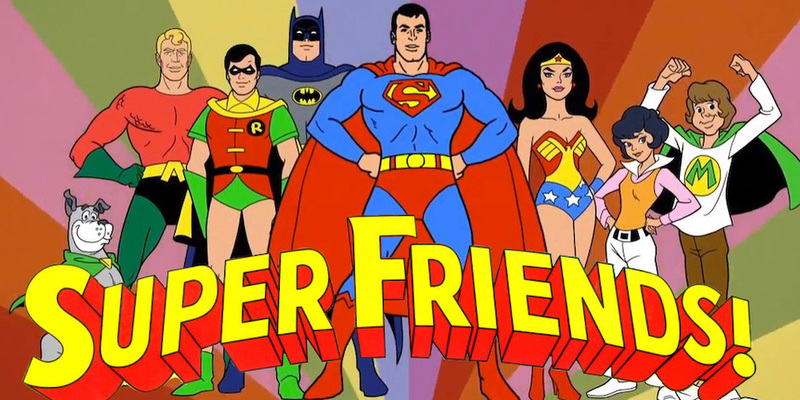 Super Friends was always a favorite guilty pleasure, with warts and all! It was an affectionate look back intermixed with a brutally honest appraisal. An annoying autobiographical aside::As a child: Whenever my friends would see me reading a JLA comic book, my friends would say “oh, it’s the Super Friends!” just like they would call Captain Marvel “SHAZAM!” and I would strange looks from everyone I corrected! Eventually, I gave up and stopped.I was tied of being called “the weird comic book guy” by everybody! Super Friends and SHAZAM!, it is! (*LOL! *) Anyway, I eagerly look forward to future installments! Thanks, JD! And I know what you mean about being that kid!